Tooth decay is the main reason for toothaches. It is caused by enamel-eroding acids, which are produced by oral bacteria in your mouth, which feed on the sugars and starches you ingest. Here below, we offer you several ways to get rid of the toothache and to relieve pain. The main benefit of oil pulling is that it reduces the amount of harmful bacteria in the mouth, thus lowering the risk of tooth infection. Put 2 tablespoons of oil in your mouth, and swish it around for 15-20 minutes. If you oil pull for a few days in a row, you can also treat bad breath and yellow teeth as well. Soak some fresh ginger root in water for a while, and then gargle with it. Black tea can reduce swelling and temporarily relieve pain, due to the presence of astringent tannin. Another efficient home remedy for toothache is the miraculous garlic. For best results, you should chew one or two garlic cloves. Another alternative is to crush a garlic clove or take some garlic powder and mix it with some table salt. Apply this directly on the infected tooth. This treatment should be done for a few days. Another fantastic remedy for toothaches is the guava. Simply chew 2 or 3 guava leaves. You can also put some guava leaves in boiling water adding some salt in it. When it cools off, use it as a mouth wash.
You will efficiently alleviate pain by chewing some fresh peppermint leaves. In case you can’t obtain fresh ones, dried leaves can also serve the cause. Salt and pepper can effectively soothe and relieve toothache, due to their strong anti-bacterial properties. Make a paste by mixing equal portions of regular table salt and pepper with a little water. Apply this remedy on the infected tooth and let it act for a couple of minutes. Relieve pain by preparing an ice cube pack at home. Crush some ice, put it in gauze and press it over your jaw or cheeks. You can also put a crushed ice cube in your mouth or gargle with icy cold water for a few minutes. This is an extremely effective pain reliever. Smash 2 cloves and mix them with some olive or any vegetable oil. Apply this on the painful area. Moreover, you can also rinse your mouth with a mixture of clove oil drops and water. Onions are highly beneficial for relieving toothache, since they contain strong antiseptic and antimicrobial properties. To reduce the pain, simply chew a raw onion for a few minutes. Prepare a thick paste by combining a few drops of mustard oil with half a teaspoon of turmeric powder. 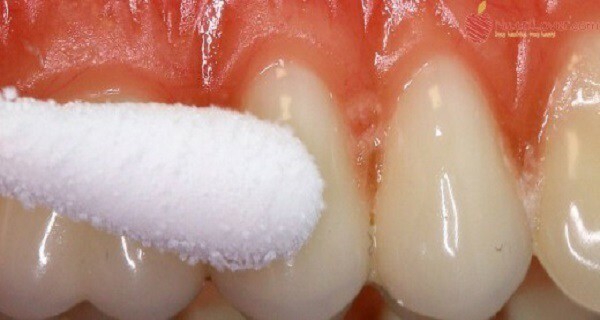 Apply this on your cavity and leave it for 15 minutes before you spit it out. Repeat this procedure regularly to relieve the pain. Salty water can be of great help when used as a mouth wash, it will reduce swelling and inflammation caused by toothache. Mix a flat tablespoon of salt in a glass of warm water to prepare it.